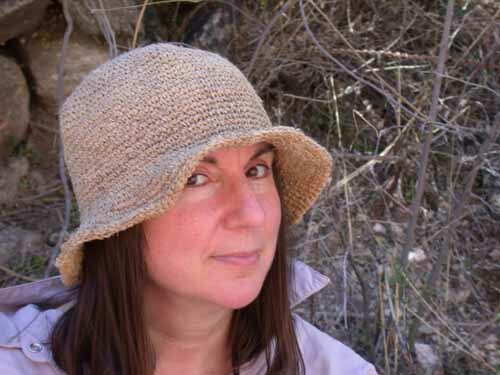 Marian Dioguardi (also known as Mae) has worn many, many hats at Dendritics. And worn them very, very well. 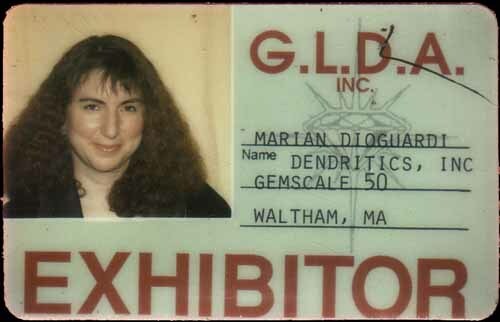 In 1989 she began helping to bring the technology to a state of salability, finding vendors and fine-tuning the assembly and testing aspects of the Gemscales. 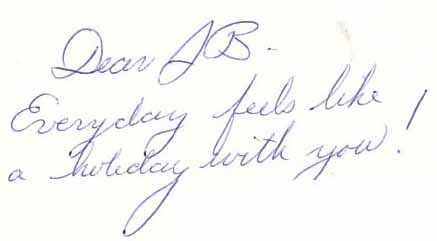 She was responsible for most of the graphic design of the labels, boxes, and instruction manuals. It was her keen eye for color which chose the colors of the scales themselves. Email her. When we didn't get adequate interest in the technology per se, she worked out testing procedures to tell good scales from bad ones and began making scales for sale. Prior to our first Tucson (1991), she was single-handedly responsible for making scales using poor old Robocal (who calibrated one at a time). She participated in the design of Hal, the multi-scale calibration robot. Marketing was another hat which she wore, formally at first and then informally. She was some 90% responsible for all our ad layouts, wording, and even supervised the photography. 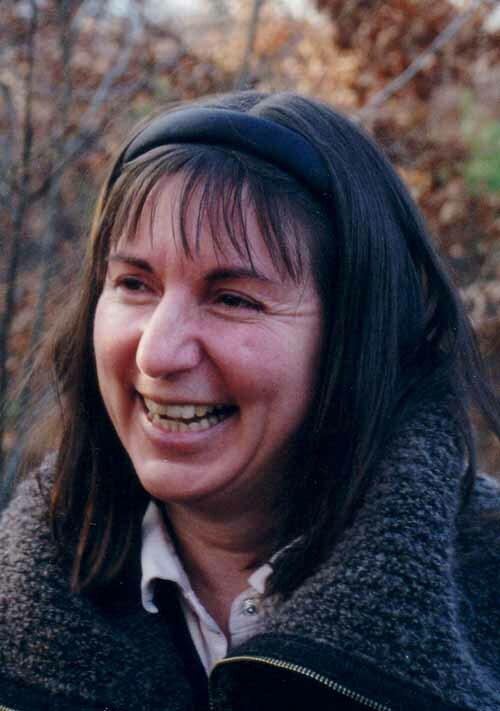 In mid 1991, once manufacturing and sales had stabilized and the product was "going", we hired Bill as Director of Sales and Marketing, and she stepped entirely into Production as Operations Manager, hiring, supervising, and working alongside our eclectic production crew until we stopped production late in 2001. For three different periods she was responsible for repairs. Marian worked closely in the design effort with Bleck Design to come up with the Dendritics 500 shape and user-functionality. Everything from the shape and marking of the buttons to the oval logo. She was critical to the way the draftshield functioned, and was instrumental in the sideways" operation of the scale. It was in part her notion to have two displays. There were two periods when Marian was responsible for our finances, once initially and later after Marian A left. At one time we had two Marians and a Miriam! Marian's nephew Timmy (Tim Casaletto) featured in this card. 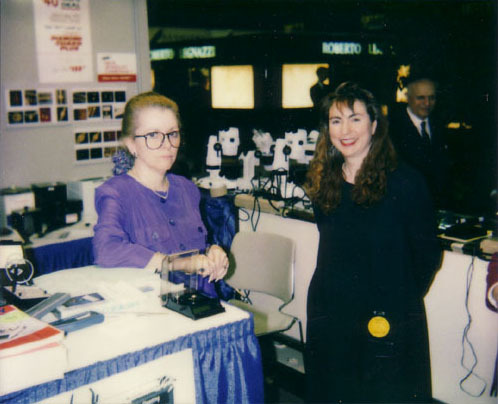 Marian (on the right, with the brilliant lipstick) is at our first JA show in February 1992, at the Kassoy booth. 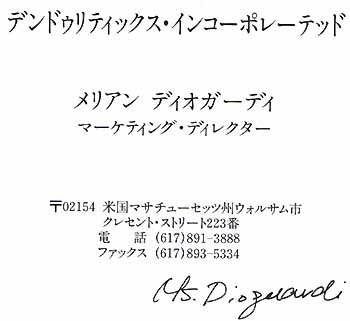 We attempted to sell the company before any manufacturing began ... to the Japanese of course! This was Marian's prototype business card.